I’M STILL PLAYING MY records in reverse chronological order, in case anyone is wondering, though I’ve not talked about that much lately. I’m in 1971, which you might say is the first year I was fully conscious of and beginning to obsess about pop music. A whole lot of good records came out that year, and it seems like the biggest standouts on my list of favorites are clustered toward the end of 1971: “Theme from ‘Shaft’” by Isaac Hayes; the double-sided hit single “Maggie May” and “Reason to Believe” by Rod Stewart; “Do You Know What I Mean” by Lee Michaels; and Aretha’s “Rock Steady” all come to mind. I was still religious at the time, and I know that because I remember praying to thank God for having the record come out during my lifetime. (Yes, really.) I had this thing for long songs back then, something about getting your money’s worth out of a jukebox, maybe. I used to call WSAR to repeatedly request they play things like “Closer to Home (I’m Your Captain)” by Grand Funk Railroad and the long version of “Won’t Get Fooled Again” and was told they can’t play those songs too often because they’re so long, the logic of which escaped me. You would think DJs would prefer long songs so they can take cigarette breaks. “American Pie” came along just in time to make the 8-minute song safe for radio; just in time for “Stairway,” that is. I became completely obsessed with the song. I would look at the album in the store, afraid to buy it. There were no words on the cover, front or back, just the scary old man carrying the sticks on his back and the peeling wallpaper. I think we had that same wallpaper in our kitchen. Even the album title was a mystery, those crazy runes no one could figure out. I tried. I did a report about the album for class—English class, I think. It wasn’t unusual to do school reports on rock bands in those days—and did as much research as one can do at that age and with no Internet. I wrote a letter to Atlantic Records with a list of questions like “How many copies of the record have been sold?” and “What do those runes mean?” They never wrote back. I remember one store listed it as Zoso because that was as close as you could get to it using our boring, modern alphabet. Another called it Runes. 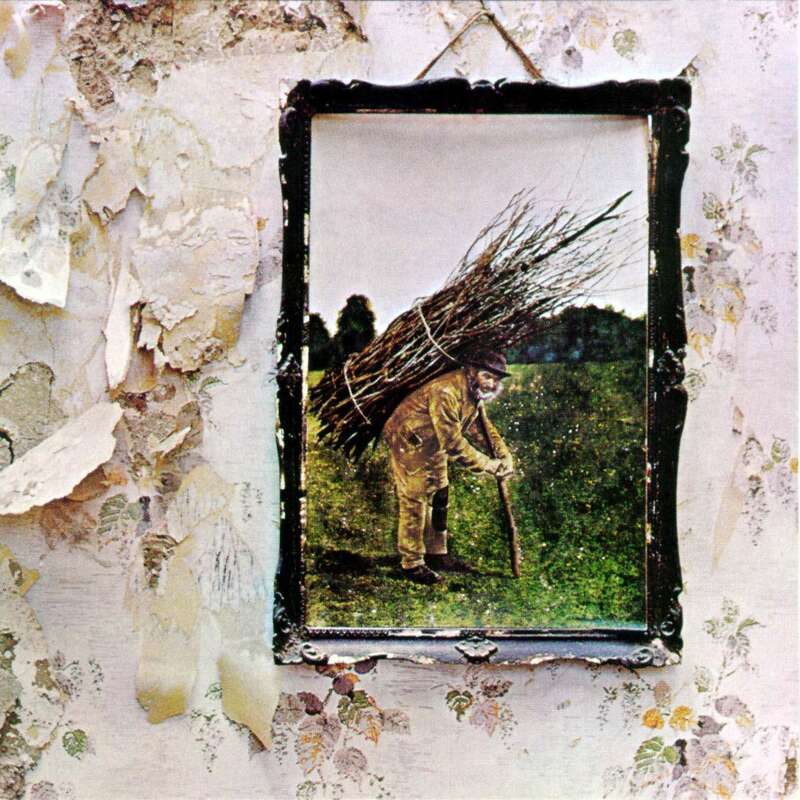 Most called it Led Zeppelin IV or just Led Zeppelin. We all knew it as the album with “Stairway to Heaven” on it. Who would have guessed Dolly Parton would cover the song decades later? If you’ve ever wondered what that song would sound like with a banjo in it, wonder no more. I tried to find the 45 of “Stairway to Heaven,” but of course there was none. I hadn’t yet figured out that some songs got played a lot on the radio without being released as singles, but I wasn’t entirely to blame—it was a new concept, at least on AM radio. I did eventually get the album, but not until 1973, when I was a full-fledged teen. Meanwhile, the song’s mystical lyrics had an allure of their own—to a teenager, anyway. Back then, we all thought these words meant something important. I’m not sure if this one has Tolkien references like some other Zeppelin songs. Maybe. It seems very Middle-Earth. In Spanish class we had to translate a song of our choice into Spanish, and most people chose simple ones. I chose “Stairway to Heaven.” I think I fudged misgiven and hedgerow, but Señorita Souza didn’t seem to notice. 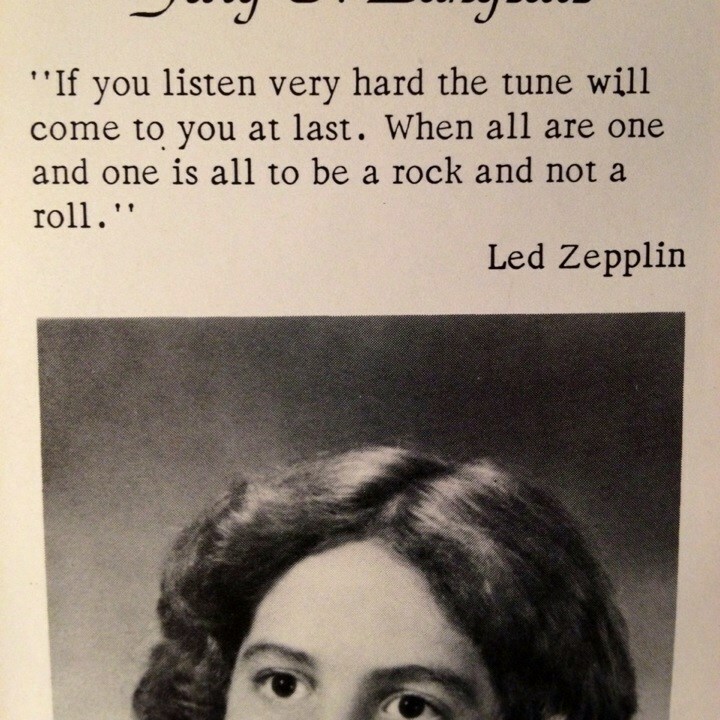 By the time I graduated, the wisdom of Led Zeppelin had been overshadowed by that of Pink Floyd. Only two classmates used lines from “Stairway to Heaven” as their yearbook quotes. I lifted my quote from an Argus poster. And it makes me wonder. This entry was posted in 00s music, 70s music and tagged 1971 music, Dolly Parton, Led Zeppelin, rock anthems, Spanish class, Stairway to Heaven by davexrobb. Bookmark the permalink. Marvelous post, Dave. I sure would love to get my hands on a copy of that letter to Atlantic Records!